The promised Dropbox app for Windows 8 and RT devices is finally here, bringing native interaction with your storage account in the cloud. Dropbox is, of course, much more than a simple storage service now, so the app takes into account the full possibilities for downloading, uploading and sharing files that it offers. Sharing can be done by full integration with the respective menu in the charms bar of Windows 8/RT, but the nice feature for automatic upload in the background we were used to in Win 7, is conspicuously missing, yet you get the nice Modern UI to somewhat compensate. 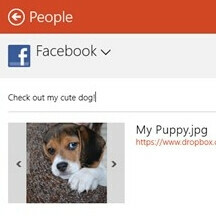 Hit the source link for downloading the Dropbox app on your Windows 8 or RT gear, if you are one of the more than 100 million users of the service.